Go back to the main Basic Aircraft Flight Page. In this category, emphasis is placed on determining the airworthiness of the airplane, preflight visual inspection, managing risk and pilot-available resources, safe surface-based operations, and the adherence to and proper use of the AFM/POH and checklists. To maximize the safety of flight operations, a pilot must recognize that flight safety begins by properly preparing for flight and by managing the airplane, environment, resources, and themselves until the airplane is returned to its tie-down or hangar at the termination of flight. This is accomplished by the pilot ensuring that the airplane is in a safe condition for flight and it meets all the regulatory requirements of 14 CFR part 91 by an effective and continuous assessment of the risks and utilization of resources, and by the pilot honestly evaluating and determining their preparedness and continuation for acting as PIC. 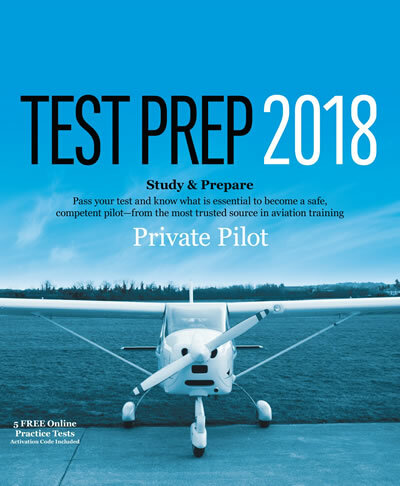 Private Pilot Test Prep 2018 – Pilot license candidates studying for the Private and Recreational Pilot FAA Knowledge Exam will find sample questions for every question in the Federal Aviation Administration exam database along with their answers and explanations. Questions from the exam are arranged by subject category, with each section prefaced by text introducing the subject matter and accompanied by specific study material. Each question is followed by the answer, an explanation of the answer, and a Learning Statement Code for further study in FAA materials. Updates are provided to account for FAA test-question changes throughout the publication year via the ASA website or e-mail alerts. Up-to-date basics on aerodynamics, engine operation, flight instruments, performance, radio navigation, and meteorology are among the subjects covered in this study aid. Includes softcover book and computer testing supplement. You may also find the Private Pilot Oral Exam Guide helpful in your preparation for your FAA oral Exam.